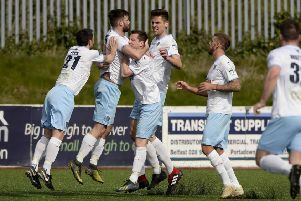 Ballymena United defender Caolan Loughran has been spending hours training under the watchful eye of a form er boxing World Champion before he takes to the field at Seaview on Saturday. The big defender has been training in his father - and former WBO World champion - Eamon’s gym as he looks forward to facing Carrick Rangers in the League Cup Final on Saturday. Loughran has made huge strides this season and his partnership in the centre of the Sky Blues with Kyle Owens has worked well. Loughran is just pleased to be in the mix for the shoot-out against Carrick Rangers. “I wasn’t expecting to be in the team at the start of the year but I worked hard and took my chance. “It’s been brilliant. I come from a sporting background but this has been a fantastic year so far. “Hopefully we can top it off with a win in the final. Caolan - who has made 22 appearances for United this season - is proud to represent his home town team. “I’m a local lad from the town - I know what it means to the fans, I know what it means to the people around the town. “Everyone’s talking about this, everyone wants tickets, everyone wants to be there. ”To win it would just be a dream. I was at last year’s County Antrim Shield final as a fan and watching it, I was dreaming to be on the pitch. “Hopefully I get the chance to perform in the final this time,” he added. Caolan says his father has been a great source for advice in the run-up to the final. “My dad says to make my own stories and my own headlines. “At the start, everyone’s going to be talking about him but I want to make my own way in football. “It’s good to have him behind me. He’s always told me when you win, don’t get too high and when you lose, don’t get too low. The scorer of two goals this season knows that Carrick will be no pushover in the final at Seaview. “They are a good side and we have had a few good games against them this year. “It is a huge chance for both sides to win a trophy, so they will be up for it and be determined to getb their hands on the trophy. “It will be tough but we are also determined to get our hands on the trophy. “It should be a good game,” he added.